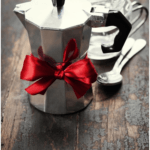 For anyone who loves to smell the inviting aroma of coffee while making their morning (or evening) brew, using an electric coffee percolator is the way to go. 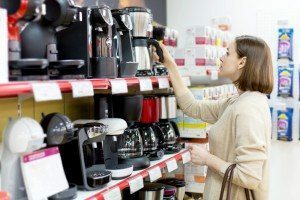 While some people might be used to using a stovetop model which essentially does the same thing, an electric percolator coffee pot provides the added convenience of managing the temperature and brewing process for you. This is especially helpful if you have a habit of getting distracted and leaving things on the stove! There are a number of opinions about what makes this one of the best but for us, it’s quite simple really. In our view, convenience and usability should be some of the main qualities. This particular model is made of stainless steel and has a sleek chrome finish. 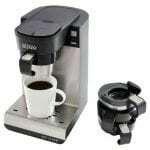 With dimensions of -1/2 by 5-1/2 by 12-3/4 inches, the appliance can make up to 12-cups at a time. With all that capacity, it is the perfect option for entertaining. As opposed to a stovetop version, you won’t have to listen out for frothing and bubbling. Once the coffee is brewed, the appliance automatically switches to a “keep warm” mode to avoid over-brewing or burning. With an indicator light that switches to green once it has finished brewing, it’s also easy to know when your cup of goodness is ready to drink! This electric coffee percolator also has a detachable cord. This means you can easily move it around and outside of the kitchen which is helpful when you’re looking to serve your guests directly from the table. Overall, you’ll note that this percolator has the same vintage style as models from the 1950s, which makes it a perfect addition to anyone looking to add a bit of retro appeal to their contemporary kitchen. 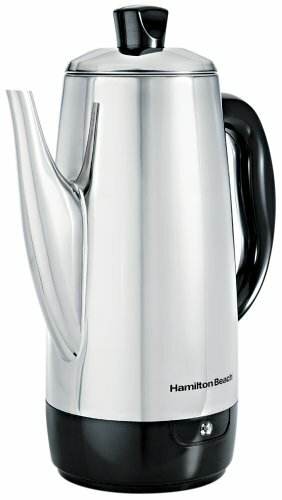 However, unlike a true vintage electric coffee percolator, with this model you’ll have the added benefits of contemporary features like a drip-proof spout, an easy-to-grasp lid, a heatproof handle, and a stainless steel permanent filter basket which prevents grounds getting into your cup of joe. 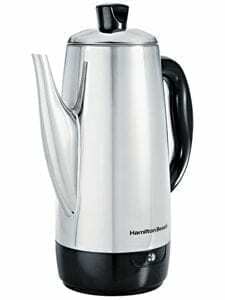 The smell of coffee is particularly prominent when brewing with a percolator. Consider it an added benefit for all the fans out there. This is the feature we like most, as effectively, it gives you something that most other brewing methods can’t provide. For those that are sometimes a bit absentminded, this feature means you won’t need to worry about burning the coffee, or if it’s going to bubble over on the stove. For everyone who has handled anything that combines metal and electricity and had their fingers burnt (literally), this feature is a must-have. The protective heatproof handles and knobs make it safer and easier to use when making a hot beverage. No one enjoys getting hot liquid spilled on them, even if it is by mistake. That won’t be the case here though, as the drip-proof spout really helps to make sure that the hot drink gets straight from the electric coffee percolator into your cup. Another good point to make is that coffee percolators are easy to clean. You simply give it a few minutes to cool down after brewing. From there, take out the filter and empty it into your garbage or compost. Then you can either rinse or slot the filter into the dishwasher for even easier cleanup. The appliance is cleaned by rinsing it out. After that, it will be ready to use once again. It couldn’t be easier to use this appliance. Once you’ve got the basics down, like making sure to unplug the machine first before adding anything and mastering how much water and coffee to add, you’re good to go. Assembling all the parts for brewing also couldn’t be more straightforward. Furthermore, the fact that the appliance automatically switches to “keep warm” mode once the brew is done ranks it high up on our list for simplicity. 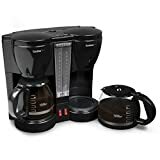 As this electric percolator coffee pot has no on or off switch, for safety reasons make sure that the jug is disconnected from the power source in the wall/surface before you start to do anything. Once you make sure that the area is safe, pop out the filter from the jug. 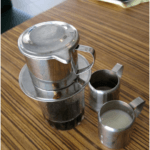 You can start to add water to your electric coffee percolator. The brewing process won’t work without it, and it’s never a good idea to boil any kind of electric device without water in it as it could burn out. All you need to do here is to add as much water as you need for the particular brew. For example, if you have six people coming over for a meal and they’d each like a cup of coffee, you should fill the jug up to the 6-cup mark. This is indicated by the lines on the side of the jug. Once you’ve filled up the jug with water, you then take the stainless steel filter and fill it with as much coffee as you need. Following on from above, if you’re making cups for six people you will then add six tablespoons of coffee to the filter. 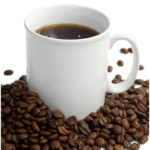 The type of coffee you will use really depends on your personal taste. It’s also advisable to use a grind that is suitable for a percolator coffee pot. 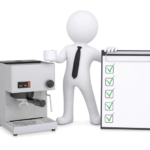 You will be able to find out this information by asking your local coffee provider for recommendations on the type. 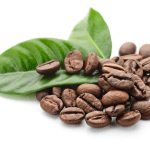 Alternatively, you can read up some more about different types of coffee article. 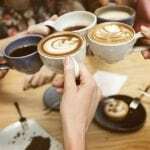 If you’re unsure how sensitive your guests are to caffeine and would like to adjust the amount of coffee to suit them, you can read more about how much caffeine a cup of coffee contains and then work from there. Once you’ve added the water to the jug and the grounds to the filter, you then place the filter on top of the water part of the jug. Secure it in with the necessary filter accessories to keep it in place. Once everything is ready, you can then plug the machine into the wall using the detachable cord. With that done, you can get the brewing process going. You’ll hear the noise as soon as the machine starts to work and you’ll know it’s ready when you see the indicator light change color to green. If you’re close by, the enticing smell of the coffee will probably alert you sooner though! Once you see the green indicator light come on, it’s ready. You can either leave the coffee to keep warm while you continue to entertain your guests for a while, or you can choose to serve it immediately. Simply remove the detachable cord from the main body of the device to be able to handle it freely. Ability to make coffee for large groups of people: no more slaving over the stove or boiling multiples kettles at your next dinner party! 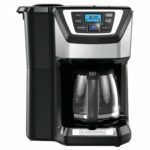 If you’re looking for a simple way to brew your grounds at any time of day, you’ll be hard pressed (pun intended) to find something that is easier to use than the Hamilton Beach Electric Coffee Percolator. Apart from the minor drawbacks above which shouldn’t be an issue if you’re aware of them, we think it’s a functional and inexpensive addition to any kitchen. Some vintage style might hesitate to use an electric coffee percolator. The truth is though, they’re missing out on a really straightforward experience. One that not only brings with it the aroma of a fresh brew, but also the ease of use that comes with any modern appliance worth having.